With more than 25 years of band history and a total of 14 studio albums, Overkill have proven to be a constant in the genre of Heavy Metal. Originally formed as a quartet in New Jersey, the self-proclaimed “Wrecking Crew” released several albums on the metal label of the 80es, Megaforce Records, before moving to Atlantic and to Regain later on. Overkill have played in every corner of the planet, and their never-ending tours let them be part of all important European festivals. Wherever Overkill turn up, hords of metal fans pay deference to the band, and every icon of Heavy Metal, either old or new, has shared the stage with them. By signing a new contract with Bodog Music, Overkill have concentrated all their energy on the cooperation with Jonny and Marsha Zazula, the former owners of Megaforce Records, who nowadays are the head of the US-team of Bodog Music. 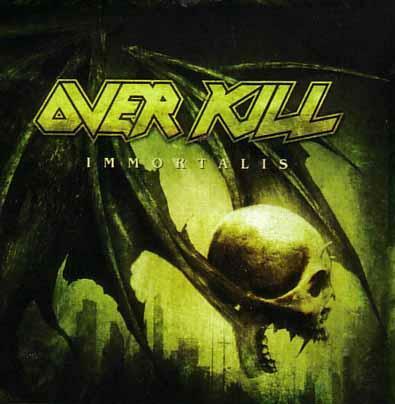 On October 5th, Overkill will unleash their 15th studio album called “Immortalis”. At the side of the fouding members around singer and frontman Bobby “Blitz” Ellsworth and bass guitarist D.D. Verni, guitarists Derek “The Skull” Tailor and Dave Linsk are still part of the show. Ron Lipnicki is the new drummer of the band. There are only few in the world of Heavy Metal who are as respected as Overkill, and the band itself is more than ready to climb back on the Olymp of this genre. Overkill will show the world that they still belong to the crème de la crème, which can easily leave the „New School” behind. The CD will be released as a normal case version as well as a Limited Edition Digipak with a Bonus DVD (live @ Wacken Open Air 2007).